Noise level has been an issue at times and after several complains it still happens frequently. I enjoy being close to campus and the amenities of the apartment. I haven't lived here long an I was worried about if people would be loud or anything. But so far it has been very good and my neighbors are nice and very quiet. Hello Christina, Thank you so much for your review. We are elated to have you as a resident here at Wolf Creek and are happy to know that your stay thus far has been an enjoyable one. Please let us know if we can be of assistance in any way. I enjoy living at Wolf Creek because it’s affordable and there are always activities and give aways. I also like having access to the gym and study area in the office building. Thanks for your feedback, Johanna. Mia, it's our goal to exemplify stellar customer service to all of our residents and guests. We are elated that you notice our efforts and we thank you so much for making Wolf Creek your home. Since there is always room for improvement in anything, please feel free to continue to share your feedback with us. Love living at Wolf Creek Apartment! Convenient location for my classes and not far from everything in town. I love the 24 hour gym and tanning available! We're so lucky to have you as a resident, Jentry! We are happy that you enjoy our amenities. If there's ever anything we can do to enhance them please let us know. It is a great way of transitioning to adult life as far as living arrangements are concerned. Plus the benefits of staying here are nice as well. Thank you so much for the kind review, Kyle! We're always looking for new programs, events, or amenities we can add. Feel free to continue giving us your feedback. Thank you so much for the kind review, Tiera! We always want you to be share your experience with us. If we're able to enhance your living experience with us please keep us informed. Welcome to the Wolf Pack! I love how quiet the neighborhood is overall and how safe the neighborhood has been since I first moved here. However, I hate how thin the walls are and being on the bottom level you hear everything on top of your apartment. Tyra, we are so thankful that you chose to make Wolf Creek your home again. We appreciate you sharing your feedback with us. We try our best to provide exceptional customer service to our residents. It's totally understandable how difficult it can be sometimes when it comes to apartment living and neighbors. However, we do have protocols and provisions in place to address these difficulties. Our management team is dedicated to the resolution of certain living issues. If you think of any way we can help, please feel free to stop by the Leasing office at any time. We'd love to hear more from you. I think it is a great area to live. Living here has helped me to save in many ways. It’s convenient and affordable. The staff is excellent and is always willing to help. Thanks so much for the kind review, Jessie! We love being able to make a difference in the lives of our residents. We are grateful for the opportunity to be able to serve you as a valued member of our community. Please continue to share your feedback with us. Amazing review, Erin! We are just as pleased having you as a valued member of the Wolf Creek community. We love hearing from all of our residents. If you ever think of something we can do to enhance your living experience do not hesitate to let us know. As a resident I have absolutely loved everything about wolf creek. I lived at stadium view for awhile which was much “nicer” in terms of appliances and being upkept but it was so so so much less than WC in terms of the community. Wolf creek feels like home. I love being able to be at wolf creek and be friendly with the workers and management. I’m not scared of my landlord/property manager, I love having him around! All this and more makes WC the BEST place to live EVER. Carissa, we are elated that you are enjoying your living experience with us here at Wolf Creek. It is our continuous mission to provide warm heartfelt memories for our residents. Please continue to share your feedback with us. There are great things to come and if you ever have suggestions on how we can improve please be mindful that our office is always open! It's a joy having you as a resident. The apartments are nice and Trenton works with you to get an apartment here. There’s dog poop everywhere so be careful of your step. That is the only downside of this complex. Welcome to Wolf Creek, Tirane! We're so happy to have you as a resident in our community. We thank you so much for your detailed feedback. We strive to enhance the living experience of all of our residents. Our devoted maintenance team does property sweeps every weekday for trash and pet waste. If there's a specific problem area we need to direct our attention to please reach out to us at the office and make us aware. We will be diligent in seeking alternative measures to minimize this issue and create a lasting harmony between our residents and the precious pets of our community. Please continue providing us with your feedback. So far it’s been wonderful and move in was a breeze which was a plus for me. My roommates are decent guys, I can tell I’m going to enjoy staying here! James, we're excited to have you as a new member of our pack! We look forward to fostering a great relationship with you. Please continue sharing your feedback with us. Welcome to Wolf Creek! Living in 'Wolf Creek apartments is very nice. I've been here for nearly 3 months and I have not had any complaints thus far. The clubhouse is beautiful and I cannot wait to get into the pool during the summer months. Welcome to the Wolf Creek family, Kelly!! Keep us posted on your living experience with us. Let us know if we can do anything to enhance your living conditions! Wolfcreek is a very nice place. Low crime and violence happens here. My neighbors aren't loud and they speak. the staff is very nice and the maintenance workers are always on time. Thanks for sharing your living experience and point of view with us, Noah! We're definitely trying our best to keep things as safe and enjoyable as possible for all of our residents. We love having you as a member of our community. I been at Wolf Creek for three years. Current property managers Trenton and Laquita have worked with me make my stay very satisfying. LOVE IT!!!! Ricardo, you're an amazing resident! We thank you so much for your continued support and love during your stay. As always, keep us informed on how we can improve even the more. I love living here! Nice apartments and furniture is nice as well! I was paired with a roommate that actually matches my personality and we’re close friends now! We appreciate the amazing review, Kurstin! It's a joy having you as a resident. Living at Wolf Creek has been quite great. I haven't had any major issues arise or anything. I don't have a need for much more than what Wolf Creek provides so I'm happy living here. Hello Jake, Thanks for leaving us a great review. We are happy to hear that your stay has been an enjoyable one and that we have met your living needs thus far. 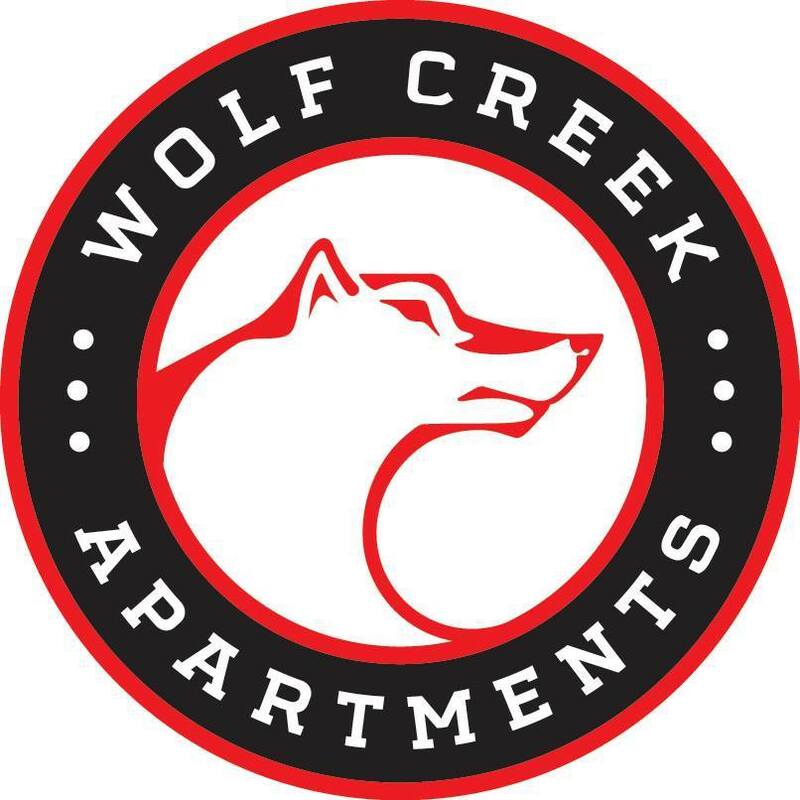 If ever you have any suggestions for how we can continue to make living at Wolf Creek great, please let us know. I have loved living here so far! It is the perfect balance between being off campus, but still being close to campus. The main office has been very helpful for all my new resident needs. Caitlin, We are excited to hear that your stay with us has be an enjoyable one thus far. We are happy that we have been of great service to you .Thanks for your awesome review and please let us know if we can be of any further assistance to you. Wow! Great review, Diana! It's a pleasure having you and Monie here with us. Please let us know if there's anything we can do to enhance your experience. Don't forget to bring Monie by the office to see us! The experience has been great so far. It reminds me of my college days, but I have more space and it's more like a home compared to my last apartments. Thanks for your incredible review, Kyle! Please continue to share your experiences with us. We love hearing from our residents. Staff is super friendly. Just takes a really long time for maintenance to get to your request. However some people park in designated handicapped spaces and it's annoying to deal with whenever a handicapped relative comes to visit. Hi, Tyler! Thanks you so much for your review. We strive to respond and handle all maintenance issues as quickly as possible. In addition to calling the office, you are also able to put in your service requests via the online resident portal to ensure that we receive your requests in a timely fashion. As always, we appreciate you for sharing your experience and we value you as a member of the Wolf Creek Community! To alleviate the parking issue we will increase the number of rounds we make for parking violations. Please let us know if there are any other improvements we can make. The staff is very nice and helpful. Its perfect for someone new to the area. They also do a great job with pairing you to your roommates. I loved all the roommates I've had here. Thanks, Konstandena! We hope that we have made your living experience with us as enjoyable as possible. We enjoy interacting with you at our various resident events. Don't hesitate to give us input on how we can make our events even better and more fun! Living at Wolf Creek is AMAZING! The staff is always friendly and helpful. They have fun games and different activities for the residents! They text and email you when packages arrive for you. Just going above and beyond to make this such a homely experience!! Kevin, you and your family have been with us for a few years and it's definitely a joy having you all as residents. We try our best to create an environment that is enjoyable for all! It's our goal to make every individual feel apart of our big Wolf Creek family. Feel free to let us know if you have any ideas or suggestions on how we can improve. I'm from Chicago so it's pretty decent. Never had the best experience with roommates but 3rd time is a charm. My roommates are pretty cool even though I barely see them. Welcome to the Wolf pack, Ronnicia! Residents like yourself make it all worthwhile. We are super excited that your stay with us has been enjoyable and we hope to keep you here for more years!